The McPherson Bullpups scored on the first play from scrimmage Friday night on an 81 yard run by Jace Kinnamon and never looked back, on their way to a 62-6 victory over the Abilene Cowboys. Neither team scored in the second half and the final two quarters were played with a running clock. The 62 points that Abilene yielded was the most surrendered by a Cowboy team in school history. McPherson ranked 2nd in 4A behind Bishop Miege, racked up 443 yards of total offense on the night. The Bullpups were led by Kinnamon, the 6’ 204 Senior running back had 12 carries for 151 yards and 5 touchdowns. 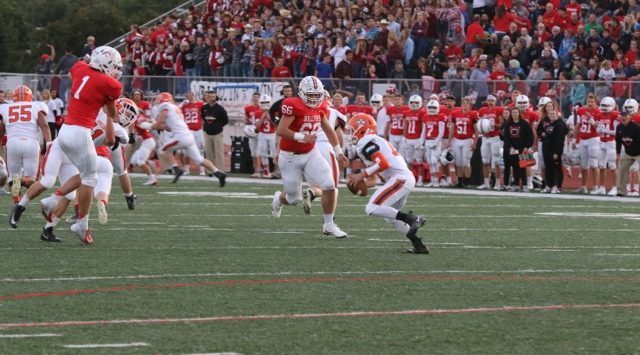 Senior Quarterback, Kyler Hoppes was also dominant as he connected on 11 of 15 passes for 230 yards and 3 touchdowns. His favorite target was Senior Gabe Hoover, who had 6 catches for 167 yards and 2 touchdowns. All of their stats were compiled in the first half. Abilene was held to 75 total yards in the game. Their lone touchdown came from Sophomore Caleb Burt, who scored on a 17 yard run with 2:49 to play in the third. He also had the longest play from scrimmage on a 54 yard run, on that same drive. McPherson improved to 4-0 for the first time since 2011 and they will travel to Buhler next week. The Cowboys lost for a third straight week after opening the season with a win at Clay Center. Abilene’s season won’t get any easier as they travel to Towanda next week for a neutral site game with Pittsburg Colgan, who is ranked #2 in Class 1A. The Cowboys will then have a trip to Coffeyville the following week.